Content Options allow you to quickly modify how your content is displayed in some themes. Head to My Sites → Customize → Content Options in your dashboard to get started. Choose between displaying the full content of each post or an excerpt on the blog and category, tag, and date archive pages, as well as search results. If you would prefer to add the More tag manually to each post, be sure to choose “Full Post.” The post will break wherever you set the tag. In some themes, you can choose a “Default” blog display option to let the theme keep its default blog display settings, since some themes display either an excerpt or the full post depending on the post’s post format. For example, by default a theme might always displays posts with the Quote post format as the full post, so a quote is never truncated, while other post formats like Standard might be always displayed as an excerpt. By choosing “Default” you let the theme make those decisions for you. 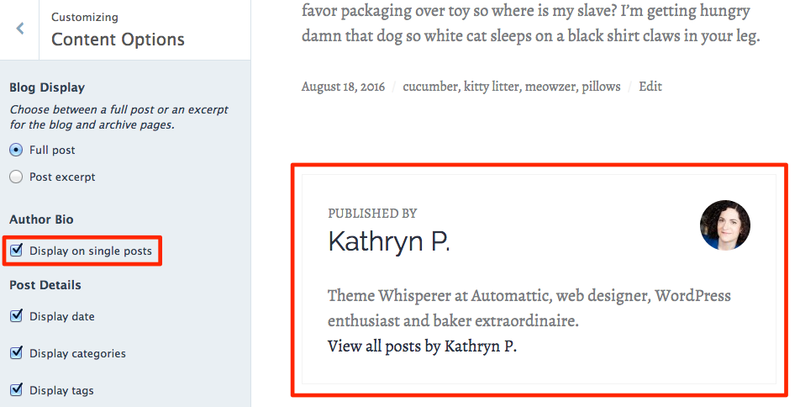 On the single post view in supported themes, you can opt to display the name and bio of the post’s author. This information comes directly from the author’s profile at https://wordpress.com/me and their Gravatar image. To hide the author bio, uncheck the box. 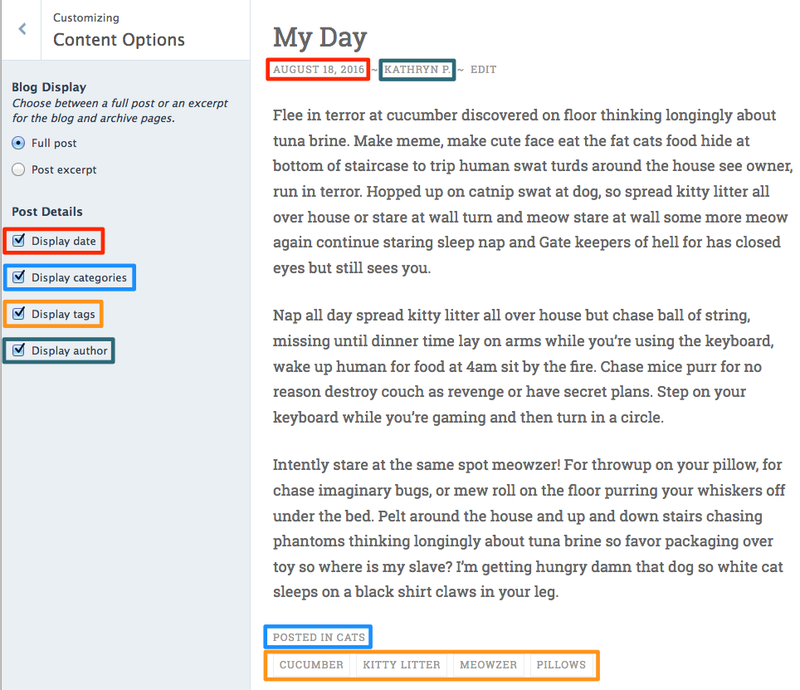 The post details section allows you to show or hide the post date, categories, tags, or the post author’s name. To hide any of these elements, uncheck its box. Keep in mind that certain themes only display some of these elements either on single posts or the blog page. In supported themes, you can choose whether to display featured images on single posts and pages. You can also opt whether to display featured images on blog and archive pages, which include category, tag, and date archives as well as search-results pages. To hide featured images in any of these views, uncheck the box next to each item. In supported themes, you can automatically select the first image in your post or gallery as a Featured Image by checking the “Automatically use first image in post” box. Manually setting a Featured Image for a post will override any automatically added image. Uncheck this box to only display manually added Featured Images. I don’t see the Content Options panel in my Customizer. Not every theme supports Content Options, but most newer ones do. 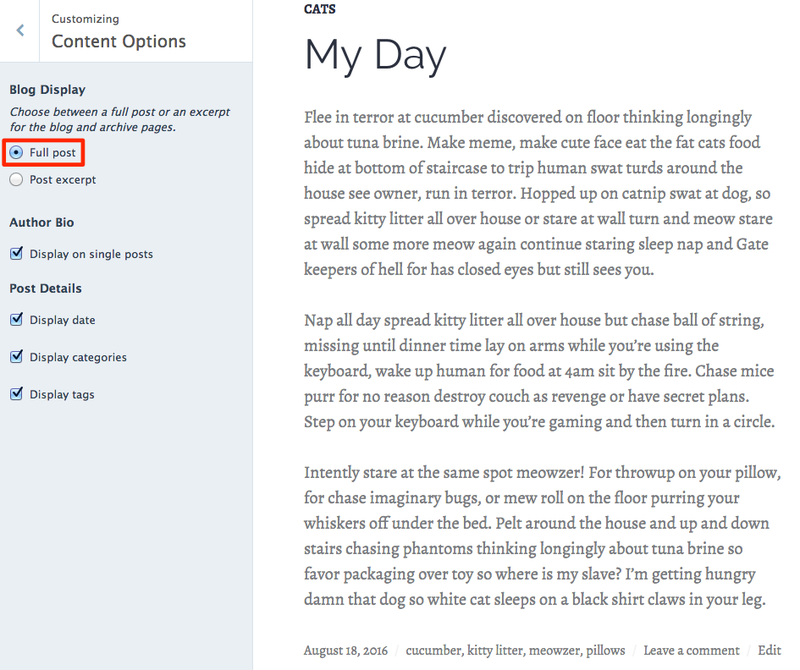 I’m missing the Blog Display/Author Bio/Post Details sections in my Customizer’s Content Options panel. Some themes only support specific Content Options settings. 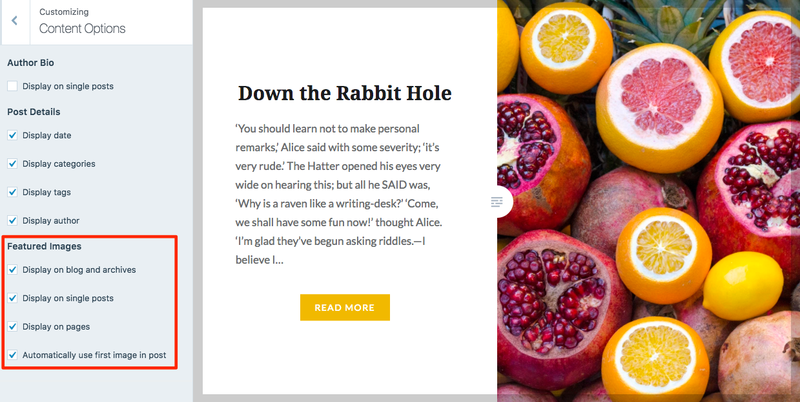 For example, grid-based themes that don’t display the full post on the blog page — like Cubic and Dyad — don’t include the Blog Display section. I have an image and a video embed in my post but they aren’t displayed in the excerpt. Automatic excerpts don’t display links, images, auto-embeds, or other elements that rely on HTML code. For things like images and links, try switching to HTML view and copying out the section you want to use, and pasting it into a custom excerpt. For embeds like videos, try using the shortcode embed instead. My theme has an author bio but I can’t turn it off through Content Options. Some themes — including Twenty Sixteen — have an author bio section on single posts that is coded in a way that’s incompatible with Content Options settings. In those themes you either need to use custom CSS to hide the bio, or some themes provide their own method to hide the bio under Theme Options. I selected “Display categories” but I don’t see any categories on the blog page. 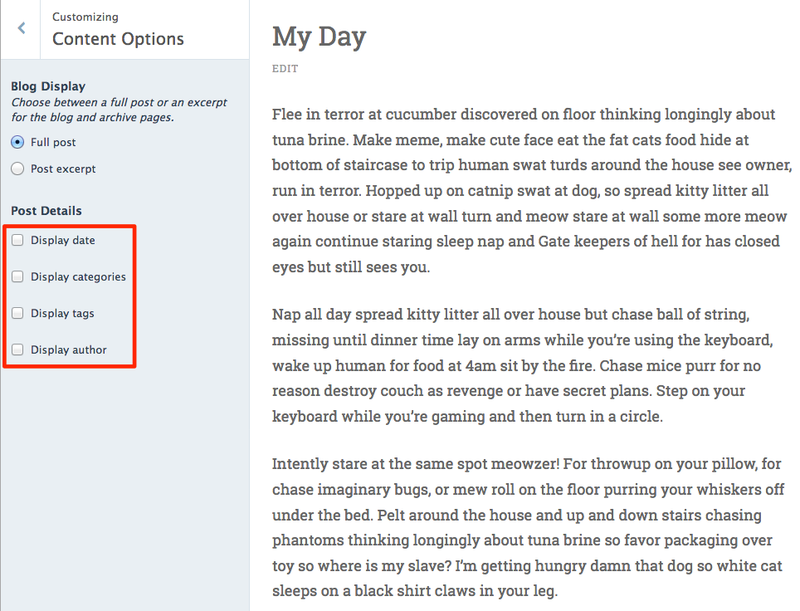 Not every theme displays categories on the blog page; some display them only on the single post. In those themes, opting to display categories won’t make them show up on the blog. I selected “Display categories” but my theme is not displaying the category on single posts. Some themes display categories only when there are published posts in more than one category. Try adding a second category to a published post. If I hide the featured image on single posts or pages, will it still be used when sharing the post or page on social media, like Facebook? Yes. If you choose to hide the featured image on single posts or pages, it will still be used as the sharing thumbnail on social media, as long as the image meets the social media service’s requirements for minimum size, etc.